Here they are, my ready-for-the-table 15mm Later Achaemenid Persians! 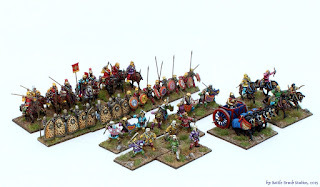 For now they'll do their job in DBA, but I'm looking to expand them (or just set up my Theban Hoplites along with them. Quite historical too, that pairing.) for playing Impetus or possibly Hail Caesar. Hope you like them!